The courses are all excellent - really inspiring and all the tutors are different, offering new ideas. 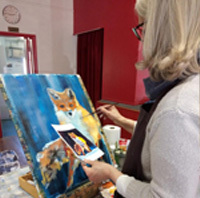 Now running for 20 years, Art Events, organised by Linda Bywaters, runs Saturday workshops and short courses on Wednesdays at the Betchworth Village War Memorial Hall. We cover all subjects in most media including watercolour, oils, pastel, acrylics and mixed media.All our tutors are professional artists and teachers and the classes are suitable for all standards from refreshers to advanced. There is an annual art exhibition and competition in aid of charity. Gift vouchers which make an unusual and welcome gift are available. Art Events offers the opportunity to explore the wonderful world of painting in a fun and friendly atmosphere! Our new programme is now on the site. With two new tutors plus all our favourites and a wide variety of subjects to choose from we are delighted to welcome you again to the workshops and courses. With concessions for Senior Citizens and students, free tea and coffee and cakes come along and join us for another series of creative and fun classes! As always, the courses fill up quickly, so book early to avoid disappointment. The booking form is quick and easy to use; just download it, complete and return with either a 24 non-refundable deposit or the full fee. Each workshop and course can be booked separately which makes it easy to fit into a busy schedule and saves commiting to a long term which might be unsuitable. The workshops and courses make popular gifts and vouchers are available. Just contact Linda on either her e-mail arteventsgroup@aol.com or telephone 01737 235497 to make a request. Every effort is made to ensure the recipient enjoys their day with us! Our thanks to all of you who have been such devoted supporters of Art Events workshops and courses. We hope you will continue to enjoy the wonderful world of painting with us!